Steel anchor bolts secure a pre-engineered metal building to the foundation. A pre-engineered steel building is only as sturdy as its foundation connections. From this information a concrete engineer designs the steel building foundation. The customer assumes the responsibility for hiring a local professional concrete engineer. Your local concrete engineer determines the depth of the slab steel building foundation— or the details of concrete piers used for structures without slabs— and the correct length for the steel anchor bolts. The plans arrive within days of the placement of the order. This allows ample time for site excavation in preparation for the steel building foundation. Ideally, you will want to have your foundation poured and ready to begin erection as soon as the steel arrives. 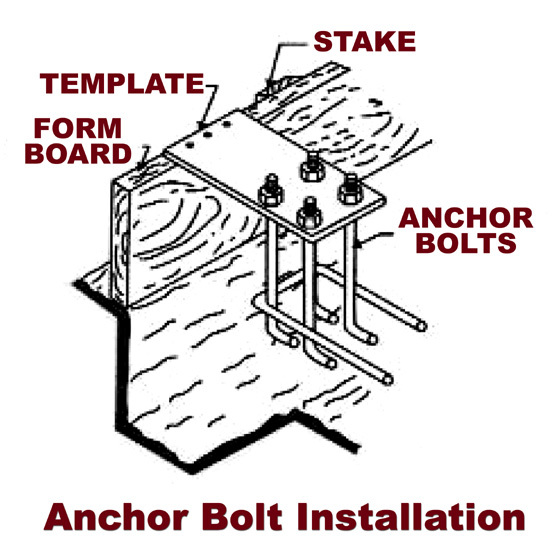 Therefore, anchor bolts do not come as part of the steel framing package. Usually, the concrete contractor acquires the steel anchor bolts locally. Steel anchor bolts must have a curved shape, like an “L” or a “J” to increase resistance and keep the bolts from shifting as the concrete dries. All foundation anchor bolts must be perpendicular to the concrete surface at exactly 90 degrees. 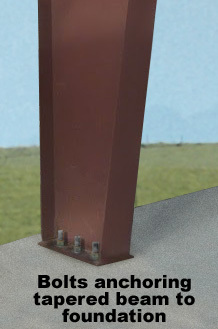 Anchor bolt placement cannot deviate more than 1/16” from the location designated on the Anchor Bolt Plan. Strict adherence to ALL governmental Occupational Safety and Health Administration (OSHA) regulations and local building codes is paramount. The structural design engineer must approve— in writing— any changes or modifications in anchor bolts. Be advised that not all metal building companies supply an anchor bolt plan with their packages. If they do not, you must pay to have one prepared. Some companies offer Anchor Bolt Plans as an option— for a fee. RHINO includes three complete sets of plans— including the Anchor Bolt Plan— with every order. By their very nature, pre-engineered metal buildings are precise. Steel building systems allow no room for foundation errors. The importance of employing a reliable and experienced concrete engineer cannot be overemphasized! A RHINO metal building specialists will gladly answer any questions about our Rhino buildings, steel building foundations, and about steel anchor bolts. Share the post "Anchor Bolts for Pre-engineered Steel Buildings"